Case of twelve 2.5 fluid ounce tubes. Tattoo moisturizer and aftercare lotion, for new and existing tattoos, from start to finish. 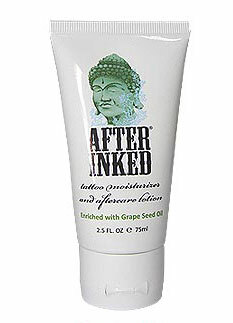 After Inked™ effectively moisturizes existing tattoos and naturally helps soothe & heal new tattoos. It is specially developed to make the tattoo healing process as easy and comfortable as possible, and significantly reducing its healing time. Tattoo artists are also discovering that After Inked™ is a real breakthrough product that streamlines the tattooing procedure, helping to soothe the skin, reduce redness and easy glide the gloves on the skin. After Inked can also be used on any permanent makeup tattoo: lips, brows, eye liner, and areola. After Inked™ is safe, Patented and it works! After Inked™ is Formulated for Perfection™. What makes our formulation so special is the integrity of the product and the finest ingredients used in the blend having Grape Seed Oil as the key ingredient, so when used on your tattoos it helps regenerating damaged blood vessels, strengthening skin tissue, reducing trans-epidermal water loss (TEWL) and preserving the skin’s natural moisture.